As a builder or general contractor we know you have your hands full managing all the details. Let us take a few of the to-dos off your plate when it comes to propane. As a member of the Master Builders Association and with over 35 years of experience working with builders in our area, we know what it takes to get the job done. 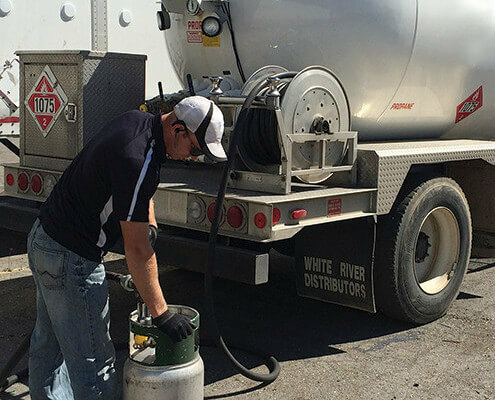 Whether you are looking for temporary onsite bulk propane service, job-site heating solutions or even permanent propane storage tanks for your residential or commercial projects, we have the equipment, experience and people to help make sure your job stays on time and on budget. Tanks, heaters, permit assistance and installation. Delivered to your job site and set in their permanent location. 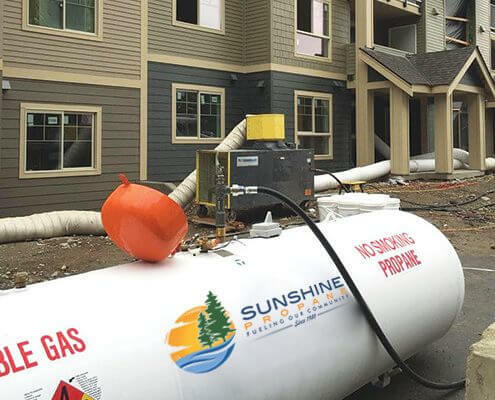 Keeping the job-site warm for Sheetrock and paint, fuel for standby generators and construction equipment, or permanent propane storage solutions for your next residential construction project…we can help! Crash Barriers for heaters and tanks. Consulting, Permitting and Installation Services. Forklift cylinders and cylinder cages available. Portable #100 cylinders for portable heating needs. Consulting, Safety Inspections, Permit Assistance. Above and below ground tanks. Free job site delivery and tank set. Fair Price Guarantee for ongoing service. 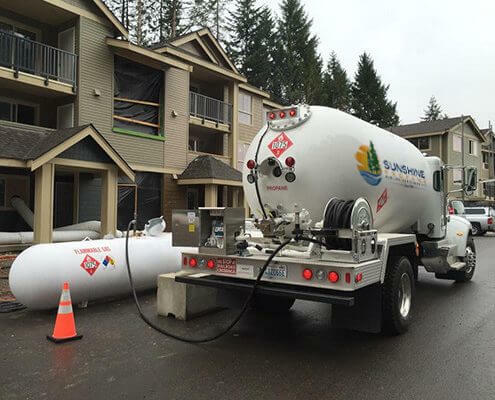 Onsite bulk propane storage tanks and fuel service to support your construction activities. Tank, heaters, installation and fuel services to heat buildings and construction sites during sheetrock, paint and other weather dependent activities. 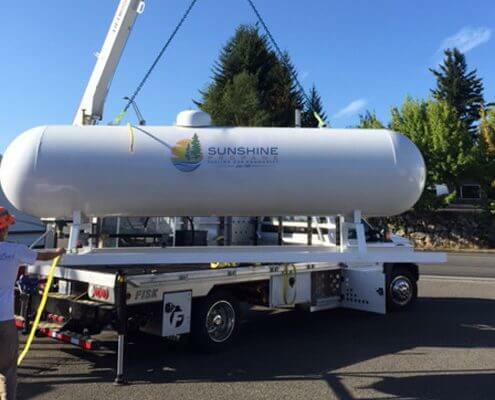 Whether using temporary bulk tanks on your job site or installing permanent storage systems at your project, Sunshine Propane will delivery and set the tanks for free..
Getting your service working quickly and avoiding unwanted downtime is critical to meeting your project deadlines. 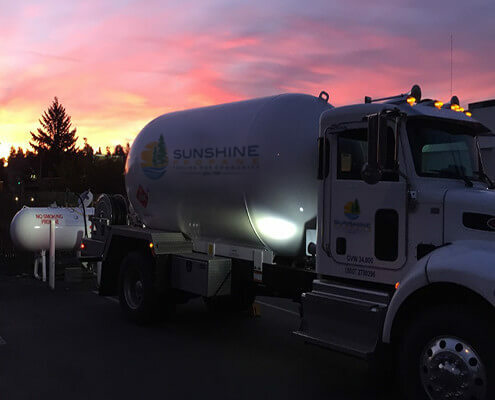 Sunshine Propane will consult and assist with all aspects of the propane service to ensure you are up and running quickly and stay that way. We outfit your tank with a wireless tank monitoring system. 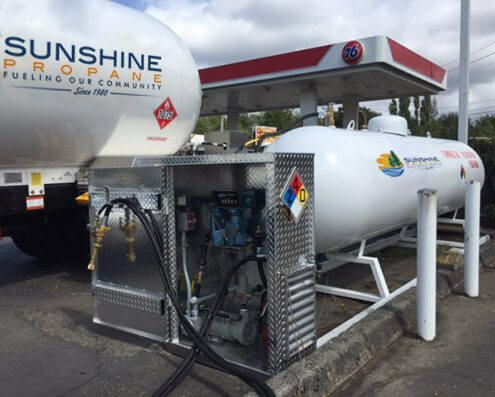 Your tank "phones home" so we always know when you need propane and schedule your deliveries accordingly to ensure you never run out. Busy projects run 24 hour a day, even on the weekends. So do we! We are available 7/24 to assist will problems, schedule emergency fills or anything else needed to keep your project running.